For most affluent investors, their wealth doesn’t just happen. They reach a level in their personal finances through a series of personal decisions and efforts. For investors who have reached a significant wealth level, it is likely that they can give credit to multiple decisions and behaviors, with each providing some stimulus to get them where they are today. In Spectrem’s quarterly study on the actions of wealthy investors, Financial Behaviors and the Investor’s Mindset, almost all Ultra High Net Worth investors with a net worth between $5 million and $25 million credit hard work for getting them where they are financially. However, there are notable differences related to other factors based on age and occupation. There are some factors which are credited equally based on age, such as education, smart investing and frugality. However, a comparison of investors under the age of 52 and those over the age of 71 show an interesting tale of wealth creation in America. For instance, 81 percent of Millennials and Gen-Xers in the UHNW segment credit taking risk as a wealth creation factor. That is notably higher than the 74 percent of World War II investors who credit their risky maneuvers. That younger demographic is more likely to credit decisions made by their financial advisor (50 percent to 43 percent of World War II investors) and family connections (17 percent to 7 percent). The Millennials and Gen Xers are less likely to credit luck (45 percent to 60 percent). Asking client investors questions about their own wealth creation might produce some interesting stories. For investors who credit luck as a wealth creation factor, what lucky event do they consider relevant to their wealth status? In terms of UHNW investors segmented by occupation, it makes sense that Professionals such as doctors, lawyers and dentists would credit education (97 percent do). Managers, on the other hand, almost universally (98 percent) said smart investing got them to their wealth level, and were also the segment most likely to select frugality (89 percent to 82 percent overall). Business owners are obviously going to say running their own business led to their wealth, but they also were most likely to point to family connections (18 percent to 9 percent overall) and advisors who know their investor benefitted from family connections might want to explore those for investment purposes. 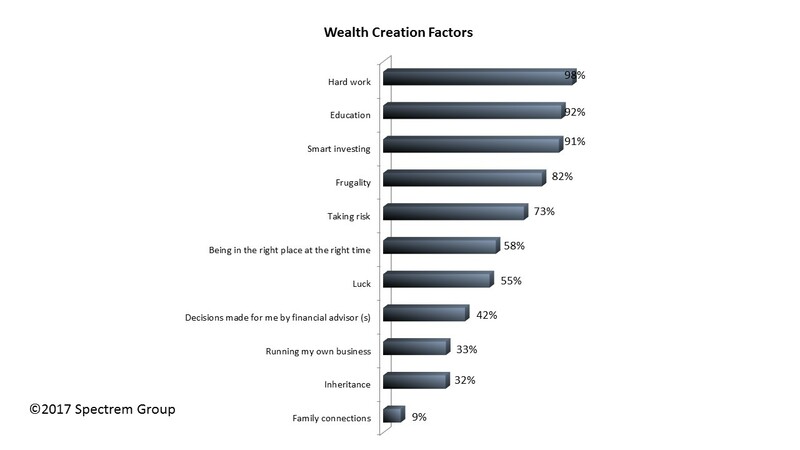 Professionals, by the way, were most likely to credit decisions made by their financial advisor for creating wealth. Having background on an investor’s financial situation can only assist an advisor in making appropriate and appreciated investment decisions. In the Spectrem study, each of the choices considered are ones that not only create wealth but are also ones that can defend or increase wealth. The study results can be a strong indicator of what clients will say and about what decisions they will want their advisor to make.